Baking Sugar Free Biscotti is not an impossible task. Many people can't enjoy sugar because of intolerance, others, like myself avoid it because of the dietary restrictions of a diabetic. It is difficult for those of us, so restricted to find sweet treats that cut down on sugar or replace sugar entirely, especially if those goodies are store-bought. But it's easy to make sugar free baked goods at home as most of these Sugar Free Recipes will prove. 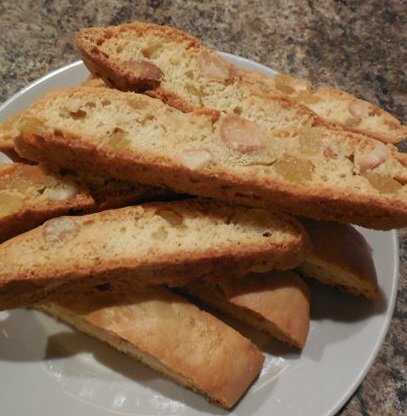 Enough about sugar take me to the Sugar Free Biscotti Recipe Collection. If you would like to know more about sugars and the sugar free options then read on. I will give you some information and tips on using the sugar replacements in bake goods. Those with Natural Sugar Replacements, like honey and agave nectar, etc. Those that fall into the artificial substitutes. Note: When using these sweeteners, you'll notice you don't use as much as when using white sugar. When sugar comes up in conversation, the first thing that comes to mind is the simple, white crystal or powder form that we are all familiar with. Brown sugar: Which is nothing more than refined cane sugar with molasses added back in for taste and improved texture. Raw sugar: Also known as turbinado sugar; is also cane sugar, but less refined. It supposedly has more nutrients intact, but I wouldn't go so far as to consider it a great improvement. Vegan sugar aka Sucanat: Is nothing but cane sugar in a raw, unrefined state. It has a darker, stronger taste that is similar to molasses. Demerara and muscavado are also less refined sugar cane variations with deeper, complex taste. High Fructose Corn Syrup: No matter what image advertisers try to project, HFCS is not really a "natural" product. It is a refined cornsugar derived product that is cheap and plentiful thanks to the government subsidation of the corn industry; that has more corn than they know what to do with. It has an alarming impact upon blood sugar levels and triglycerides, and is suspected to spike insulin levels, foster insulin resistance, and encourage Type 2 diabetes and obesity. So what are the alternatives to sugar? And how do I use them to make Sugar Free Biscotti? When it comes to substituting sugar in a recipe, it's important to remember that sugar not only provides sweetness, it provides structure, texture, adds a pleasing moistness, and contributes to browning. 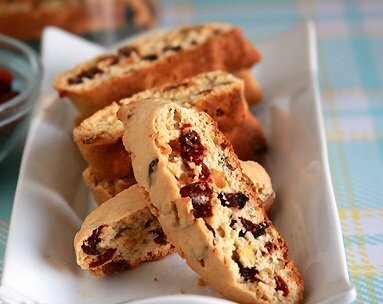 Natural Alternatives that can be used to make sugar free Biscotti. Agave: Organic raw agave nectar is a vegan fructose sweetener made from the agave cactus with a subtle sweetness and a lower glycemic impact on blood sugar levels. Agave nectar works well in baking. Use 1/3 to 1/2 cup of raw organic agave nectar (not the super-refined "agave") for every 1 cup of sugar in the original recipe and lessen the liquid called for by 3 tablespoons. Agave is a humectant and adds moisture and binding to gluten-free recipes especially if you're baking egg-free. Note: Agave is still a form of sugar. Because agave (like honey) is fructose, some folks avoid it, believing too much fructose may be harmful to the liver and raise triglyceride levels. Stevia: Stevia, a zero-calorie non-glycemic vegan sweetener, is actually an herb, available in powdered or liquid form, and if you are counting calories, it's a godsend. Stevia imparts a sharply sweet taste much sweeter than cane sugar and a tiny amount goes a long way. It does not replace the bulk or structure of sugar, in a baking recipe, so volume will be less. If used in baking to replace sugar, you may have to add additional dry ingredients such as ground/processed coconut, dates, raisins or nut meal to obtain the right texture. This is not as critical in making Biscotti as in cakes and cookies, where more sugar is used. Note: Cooked powdered Stevia can be bitter. To my taste buds, it leaves an unpleasant aftertaste in baked goods, so I would use it sparingly, and in addition to other perhaps natural sweeteners. Stevia works best in puddings, custards, smoothies and drinks both hot and cold. Not all brands are equal; there are differences in taste and potency so experiment and find a brand of stevia you prefer. Maple and Date Sugar: These two natural alternatives sport a granular sugar-like texture that works well in certain cakes, cookies and biscotti. They are both far less sweet than cane or beet sugar. Your taste buds may need time to adjust, or you could add Stevia to compensate. In term of measuring replace one cup with one cup. Coconut Sugar and Palm Sugar: An Asian sweetener crafted from the sap of coconut flower buds, is touted to be rich in vitamins and minerals. I have not tried it, but it is said to have a deep caramel, molasses like taste. Use as a one-to-one sub in recipes. Honey is not 100% vegan (due to the honeybee factor) but may be a suitable choice for less strict vegetarians and omnivores. Honey attracts moisture and that is a definite plus in gluten-free baking. 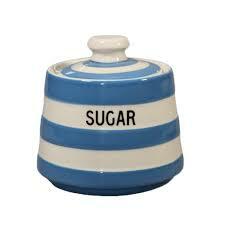 Use 1/2 to 2/3 cup for every cup of sugar called for and decrease the liquid called for by 3 tablespoons. Pure maple syrup is sometimes clarified with the milk protein casein, so check your source if you use real maple syrup it may not be vegan. As with honey, use 1/2 to 2/3 cup for every cup of sugar called for, and lessen the liquid in the recipe by 3 tablespoons. Maple syrup works best with flavors such as pumpkin, apple, vanilla, squash, sweet potato, and cornmeal. Brown rice syrup is vegan and subtly sweet. Use as you would honey or agave. These syrupy sweeteners are very good for baking, especially in moist, dense cakes like carrot or pumpkin cake, quick breads and fruity muffins. Again, the dry ingredient volume of a recipe is impacted here, so the batter or dough may need added bulk for structure and/or you may have to adjust the amount of liquid in the recipe (lessen the liquid by 3 tablespoons). Sorghum molasses: is derived from the cereal grain sorghum. Molasses has iron and other minerals, and is considered a "healthier" choice than refined white sugar. 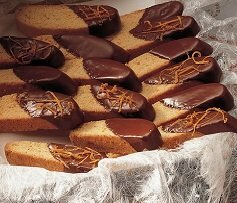 However it has a strong, assertive taste that can overpower other flavors in your surgar free biscotti. Raisins: I've used processed raisins (raisins zapped into grainy crumbs in my food processor) as my main sweetener in baked good with success. Be careful to not over process or you will end up with raisin paste. They add subtle sweetness and texture. Try using a combo of processed raisins and coconut in place of sugar. Add a touch of honey, molasses or raw agave to boost the sweetness and bind the dough. Tip: If rasins and date stick to much while processing trying adding a bit of cornstarch. It won't effect the flavor, but will prevent sticking. Fruit: Pureed ripe bananas are very sweet and make gluten-free baked goods not only naturally sweet, but moist as well. They may also substitute for eggs in vegan baking. I think bananas taste best in fruit or vanilla based recipes. I don't care for them in a chocolate recipes; but you might. Some bakers use banana baby food it's handy and easy to store. You may have to adjust the recipe to accommodate the extra liquid or puree. Chopped or processed fruits, applesauce, sugar-free preserves and jams, white grape juice and frozen juice concentrates (try frozen orange, apple or white grape juice concentrate) will all sweeten batters and baking doughs. I am not going to get into the whole discussion on whether or not artificial sweeteners are bad for your health. Some claim the artificial sweeteners cause cancer. For the most part this was born from studies which showed that high doses of a sweetener called cyclamate, in combination with saccharin caused bladder cancer in laboratory animals. Cyclamate is currently banned in the U.S. and though there is still a lot of testing being done as new products enter the market all of the following sweeteners have been approved by the FDA and are available for home use. While artificial sweeteners may provide a sweet taste, artificial sweeteners lack the browning, tenderizing and moisture-retaining properties of granulated sugar. So these Sugar Free Biscottie recipes have been modified to compensate for that. Sucralose is the one sweetener than can be substituted cup-for-cup for granulated sugar in baking. Saccharine is 200 to 700 times sweeter than sugar. It can be used in baked goods. However, the manufacturer recommends substituting it for only half of the sugar in a recipe. Substitute 6 (1-gram) packets for each ¼ cup sugar. It is sold under the name Sweet and Low®. Aspartame is 160 to 220 times sweeter than granulated sugar. This sweetener is heat-sensitive: it loses its sweetening power when heated, and cannot be used for cookies or cakes. The manufacturer does recommend trying it in no-bake pies and in puddings after they have been removed from the heat. Substitute 6 (1-gram) packets for each ¼ cup of sugar. It is sold under the names Equal® and NutraSweet®. Acesulfame potassium is 200 times sweeter than sugar. It is heat-stable, so it can be used in baking and cooking. Use acesulfame K in combination with granulated sugar when baking. Substitute 6 (1-gram) packets for each ¼ cup sugar. It is sold under the brand names Sunette® and Sweet One®. Sucralose is made from sugar, but is not metabolized by the body like sugar. It is 600 times sweeter than granulated sugar. Granular sucralose is the form used when baking. Substitute 1 cup granular sucralose for each cup of sugar called for in the recipe. Recipes made with this product tend to bake faster than usual, so check for doneness sooner than the recipe specifies. It is sold under the Splenda® brand name. Enough said, it up to you what is right for you and your friends and family. On to the Sugar Free Biscotti Recipe Collection. More come, check back soon!